UPDATE: Another DB Cooper Campout has been scheduled from Friday, June 21 through Monday, June 24, 2019. It involves a search of the surrounding area in Western Washington where a placard from the jet hijacked by 'DB Cooper' was found in 1978. It is near Castle Rock, WA about fifteen miles EAST of the Interstate 5 freeway. See the article linked above for full information. UPDATE: There is now a ten-minute video about the event at YouTube. It is also at the bottom of the WordPress article. One of our favorite activities outside of work is to organize camping trips into remote areas of the Pacific Northwest. 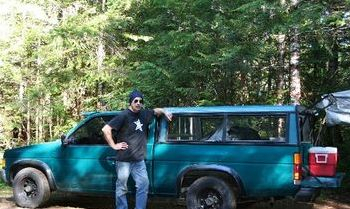 LEFT: Robert setting up camp in the Olympic National Forest in July 2018, about twenty miles northwest of Shelton, WA. How It Works: About two or three times a year, we put an announcement on this page about an upcoming campout and give details. You should make a shortcut and check in occasionally. If interested in going, just fill out the contact form on your right and send it to us. We get back to you quickly. No one under 21 is allowed since these are adults-only events. Attendance is limited to 14 people due to US Forest Service rules regarding group camps. You may also apply directly by emailing Robert at adventurebooksofseattle AT Gmail dot com. What We Provide: Generally, this is how it goes - if you are approved, we send you a detailed map on how to get to the camp site. We also provide a list of recommended gear, our cell phone number, other contact information, and set up the main camp a day or so prior to the event. ALL SITES SELECTED ARE DRIVE-IN SITES. There is no hiking involved to reach them. We pitch very large tarps for shelter, enable at least two public power sources, provide a propane BBQ for everyone to use, set up limited private bathroom and shower facility, and provide some emergency food and drink in case you run short. There is never a charge to attend. Entertainment: We use a portable stereo that plays CD's or MP3 files from a USB flash drive. For movies and television, we use an LED projector onto a 10-foot-wide screen that will take virtually any media, such as a DVD player, (we have one), flash drive, smartphone, video camera, or a laptop computer. There is a power station available for charging your devices, and we use a small generator that we run about 150 feet from the main campsite via extension cords, to keep generator noise away from the site. Campers are encouraged to bring any media or devices they wish, including video game systems, all of which we can power easily. We also test out possible sites for cell phone service, and only select those which have solid service. (This usually requires a scouting trip beforehand.) Recently, we also picked up a two-room bathroom/shower tent with the shower included, and a large portable flush toilet. Activities: Fishing, day hiking, lounging around all day, campfire, photography, and camaraderie are common. You are expected to bring three things we do NOT provide - Shelter, bedding, and a CHAIR. You would be surprised how many people show up without something to park their behind on, and we do NOT provide extra chairs. We also practice a policy of Leave It As You Found It. If you are interested in going on our next camp trip, or just want more information, fill out the form on the upper right of this page and send it to us. We answer all inquiries promptly.